I've been having telco troubles lately, so I decided to get prepaid SIMs from other networks. I didn't want to buy a new phone, so I dug up the old ones I had. Happily, despite my frustration with my telco, revisiting my old phones was a somewhat delightful trip down memory lane. I found some old photos of my nieces and other family members. I saw some old texts I had forgotten I'd saved, like the text my brother sent me to inform me that Tutay, our dearly loved and clingy Sharpei, had died. I also found some texts from someone I used to be in love with. There were old photos from trips with friends I used to travel with and a friend I will mostly probably no longer travel with. Has it really been so long ago now? 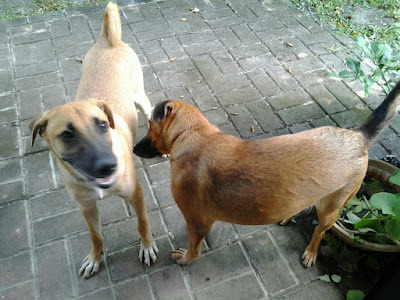 I also found the photo above of the last two dogs we had, Basha and Boris. Basha was the only offspring of Sasha, our beloved German Shepherd and Lab Mix that my mom bought off a newspaper ad. Sasha was sweet to us, but a Jekkyl and Hyde to others, especially cats. She was a big dog and needed to run, and since our garden didn't give her a lot of space, whenever someone opened the gate, she'd barrel past that poor someone and run out into the great wide open. When she had Basha, the younger dog would follow her mother out. They'd run so far out that we'd often give up chasing them and just wait until they got back home by themselves. I was always worried, but they were good dogs and they never got into trouble and never got lost. This was before our village became strict with dogs roaming the streets. When Sasha passed away, Basha never went out again. How she got pregnant, we don't know for sure, but we suspect a small dog snuck in and knocked her up. She had six puppies, and we kept the one that looked like Sasha. That puppy was Boris. He was a big bully to his siblings, and so they all ganged up on him and he eventually became the bullied one. The smaller dog in the picture above is Basha; Boris is only a puppy in that picture. He grew to be more or less Sasha's size. We've had so many dogs in my lifetime, and I loved them all, but it was Boris' death that, I think, ended my desire to care for another dog. Long story short, we had a flea infestation. I was able to nurse Boris back to health a couple of times, but that last time, it was too late. When he was sick again, he climbed up the garden chair next to the door and nudged my hand. Maybe he was saying goodbye to me. Or maybe he was asking for help again. I wish I had brought him to the vet right away. I really thought I had some time. That is one of my regrets and why I hesitate to have new pets. Boris died this year, so maybe the pain is still fresh, but I really don't see myself having any dogs of my own again. One of my versions of heaven is filled with all the dogs and other pets I've had that I failed to love one hundred percent, and they'd still love me and tell me that I was the perfect human to them. One of my versions of hell is the same, except that I am racked with guilt and unable to forgive myself. Here's to Peachy, Keenie, Chewy, Duchess, Duke, Mako, Misha, Tutay, Diwata, Sasha, Midnight, Basha, Boris, and all the other dogs, birds, chickens, ducks, rabbits, fish, and hamsters who shared our home. I loved you, but most importantly: you loved me. Thank you.